Passover begins typically in March or April of the Gregorian calendar. It is on the 15th day of the month of Nison which is on the night of a full moon. It lasts generally for 8 days. Passover is a commemoration of God liberating the Jewish people from slavery in Egypt and therefore liberating their nation under the leadership of Moses. 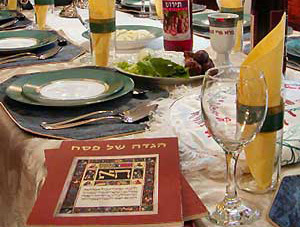 The Passover Seder meal is performed on the 15th day of the Hebrew month, Nisan. In the book of Exodus in the Bible, God freed the Jewish people from slavery. The Passover received its name from the last of the ten plagues carried out before Pharaoh allowed the Israelite slaves to leave. Provides calendars for the calendar year for Isreal. Provides the dates for holidays for the calendar year for Isreal.